This is Alma. Say hello. As you can see, Alma’s situation is a little bit abnormal, but then… so is she. A secret military research project (and how often do those go horribly wrong?) sought to capitalize on Alma’s psychic gifts. At age 8, she was stuffed into a suspension tank, and kept comatose. At sixteen, she was decanted, kept comatose, impregnated, and gave birth to two boys. Then they shoved her back into the tank. Even comatose, this makes her angry. Even suspended in the tank, Alma’s abilities grow, as does her anger at what has been done to her. Her keepers began to fear what she might become capable of, so they switched off her life-support systems, and killed her. That really pisses her off. 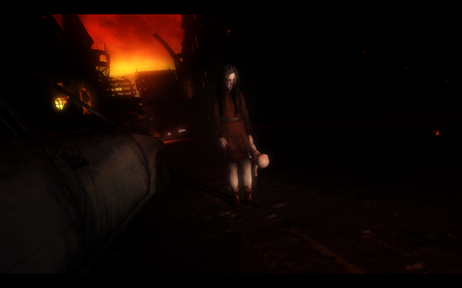 The game, F.E.A.R 1, is the story of those boys, both ultimately faithful to their mother. In F.E.A.R 2: Project Origin, Alma needs someone. She needs you. You are Sergeant Beckett, and from the twilight world she now exists in, she’s aware of you already. In a misguided attempt to gain control of the situation, some of Alma’s former keepers are going to do some terrible things to you, one of which will even drive Alma to attempt to consume you once in a while. That said, Alma (when she appears) is your guide, your protector, your early-warning system, and only occasionally is she driven to devour you. That probably makes her a better friend than most of the people you will meet. For the most part, Alma at eight years old is the better companion of her two manifestations. While casually destructive and despite a virtual monopoly on the creepy-little-girl motif, she knows you are not her enemy. Alma’s sixteen-year-old manifestation is rebellious, willful and prone to lash out, oftentimes at you. It’s a difficult age for a girl, and an even more difficult age for Alma, who both gave birth and was murdered at that age. Teenage Alma makes deep goths and axe-murderers look like flower-children. But Alma needs you. She wants you. She’s going to have you. F.E.A.R. 2 like it’s predecessor is a first-person shooter. A rails shooter with some minigame elements (and a few despicable quick-time-events). You’ll move through a variety of urban environments ranging from office-buildings to post-nuke streets taking down whatever opposes you. After Mad Science finishes monkeying with you, your reflexes will be heightened, allowing you to perceptually slow everything around you for a short time, making you considerably more effective at the taking-down part. 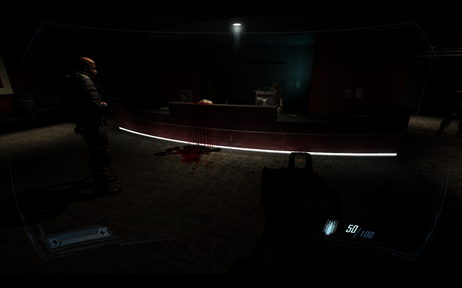 The game is a difficult, but rewarding take on a horror-FPS, and is playable without having played the first game. The AI is pretty solid, it’s full of atmosphere, and creepy set-pieces. 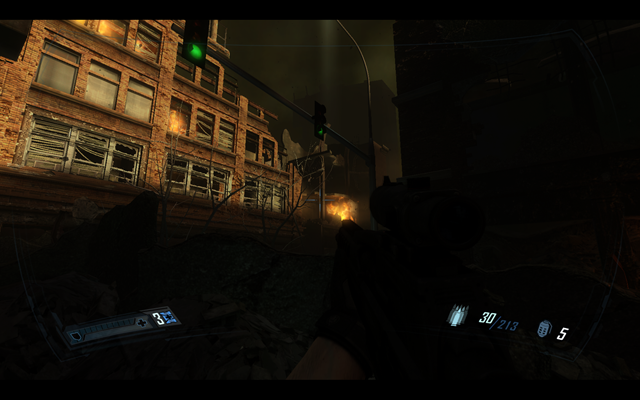 A number of difficulty levels are available, though it’s perhaps not so much for the novice FPS player. On easy mode, though, it’s not generally too overwhelming. Language is… very strong. Strong and uninhibited, much like you’d expect from situations involving violence, horror and gore, all of which are in plentiful supply. You’ll hear a lot of bad language, but none of it is inappropriate to the theme. No saving anytime, alas. You are confined to automatic saves when various checkpoints are reached. It lets you know when each one takes place, so you can choose to stop there. Graphics are more than good enough to do the job and convey the atmosphere. You can also pilot some giant robots for a few parts of the game. It’s also on sale this weekend, 50% off on Steam. Sometime soon, we’ll sit down and talk about horror. …on the other chair is Paxton. So far neither of them have displayed the behaviours of their namesake, but we’re keeping an eye out regardless. I confess that I’ve never played it multiplayer. It doesn’t have any multiplayer modes that interest me.